A heart rendering article on Captain Manoj Kumar Pandey, Param Vir Chakra, (25 June 1975 – 3 July 1999) of 1/11 Gorkha Rifles (GR), beautifully penned by Major General Raj Mehta, Param Vishisht Seva Medal, Vishisht Seva Medal, my Guru and mentor from my early military days at the National Defence Academy. When brave-hearts are martyred in India, we invariably compensate for the loss by naming residential colonies, roads, airports, auditoriums, tournaments after them. We rarely reflect over the intent that drove them to martyrdom. We do not understand why, when living was an option, they chose to die, fiercely upholding the timeless ethic of Naam, Namak, Nishan (नाम, नमक, निशान) [Honour, Integrity, Flag] that has been in the Indian soldiers DNA since the ancient killing battlefields of Kurukshetra (कुरुक्षेत्र). Capt Manoj Pandey, PVC (P), 1/11 GR was one such driven officer who died at Bunkers Area en route to Khalubar Top at 5287m (17346ft) sacrificing his life for sustaining the Idea of India. This story is about his selfless sacrifice on night 2/3 July 1999, his bloodied Khukri (खुकुरी) [inwardly curved traditional knife of a Gorkha soldier] flashing as he exhorted his charged Gorkhas with “Naa Chhodnu!” (I will not spare you) as he fell. They did, several of them dying with him but neutralizing the entrenched Pakistanis with bullets, khukris, grenades – and grit. The story of Manoj’s heroism is available on the internet in narrative and video formats. A mainstream Hindi film covers his martyrdom. Nothing could, however, be better than hearing about him first hand from his then Commanding Officer, Colonel Lalit Rai, Vir Chakra. I was privileged to do just that because Lalit is a colleague of old; a bold, brave and courageous third generation 11 Gorkha Regiment officer of pedigree and conviction. A Bishops Cotton, Bangalore product, his grandfather and father preceded him in the Regiment. Commissioned in 7/11 GR, he was commanding newly raised 17 Rashtriya Rifles (RR) (Maratha) in Doda, J&K, in 1997 when I came across him as the Deputy Commander of the RR Sector Headquarters which operationally controlled his Unit. He led from the front in an intense Counter-Insurgency deployment grid where I was as much in operations as our Units; the Deputy’s being a command not staff assignment when deployed on the Counter Insurgency grid. This is where I saw Lalit repeatedly leading his command in encounter situations. 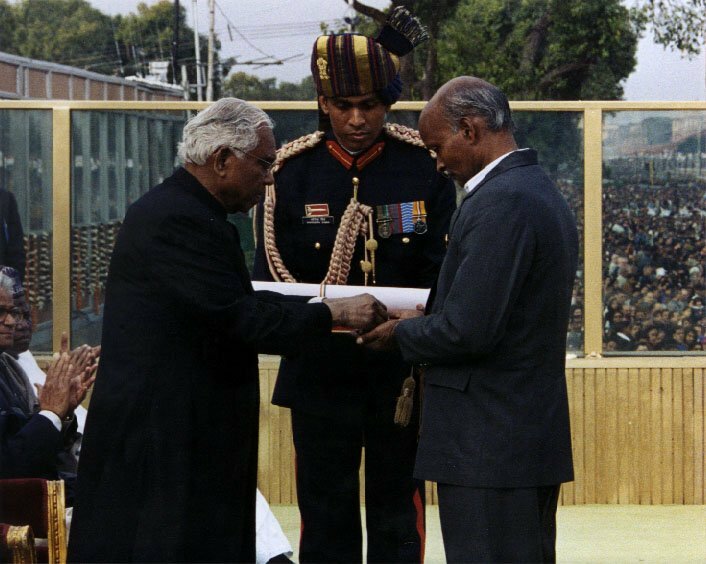 In June 1999, when the Kargil War had commenced, he was offered a chance to command 1/11 GR by his Colonel of the Regiment. This Battalion had decades earlier been commanded by his Father and urgently needed a replacement Commanding Officer (CO). Lalit accepted the challenge despite not having served in 1/11 GR. He was landed by helicopter 48 hours later, when the Unit, looking forward to some respite after a tough Siachen tenure, was pitch-forked instead into alpine war. A crisis was unfolding in the strategic but primitively developed Yaldor Sub-Sector. Ordered to retake Khalubar Top from infiltrating Pakistani Pathan troops and with non-existent road communications, his immediate task was to lead a 14 hour forced march into war with all equipment/ammunition carried back-pack with whatever troops he could muster even as his Second-in-Command (2IC) marshaled the balance men. This was on 2 July 1999 and this is where young Manoj enters the narrative. A word about him is necessary before the daunting terrain where his bravery – and Lalit’s – manifested, becomes our point of focus. IC-56959-W Capt Manoj Pandey was born on 25 June 1975 in Rudha, Sitapur District, Uttar Pradesh, to Gopichand and Mohini Pandey. Gopichand was a man of very modest means, but Manoj, the family elder, never put a financial burden on his parents as he blazed through Sainik School and Laxmi Bai Secondary School, both in Lucknow with a brilliant all-round performance in academics, National Cadet Corps and sports. Asked during his Services Selection Board interview on why he wanted to become an officer, his convincing “To win the PVC” response saw him selected for the National Defence Academy (NDA). Commissioned into 1/11 GR, a famous Battalion raised in 1918 in Mesopotamia, Manoj served in the Kashmir valley and Siachen before Kargil happened. 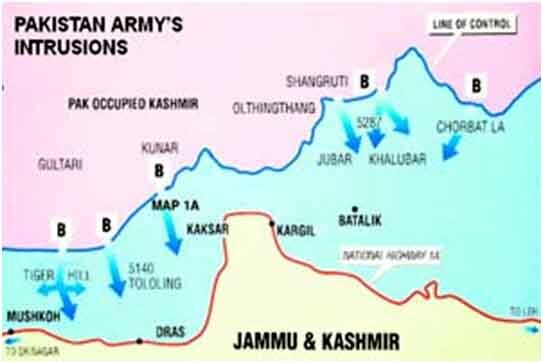 In the remote, near inaccessible Batalik sector, the infiltrators had occupied a number of ridges whose recapture was a must as these dominated the Batalik-Leh route. It took some time before the ingress routes to the four roughly parallel ridges were blocked by India. General VP Malik, then Army Chief in his book, From Surprise to Victory, recalls that a direct note to him by then 2IC Lieutenant Colonel Asthana brought out to him the importance of retaking Khalubar Ridge on priority. It had a Pakistani helicopter- supplied dump behind and clearly had to be recaptured and it was the Gorkhas led by Colonel Rai and, on his vulnerable flank, Manoj, who did it. 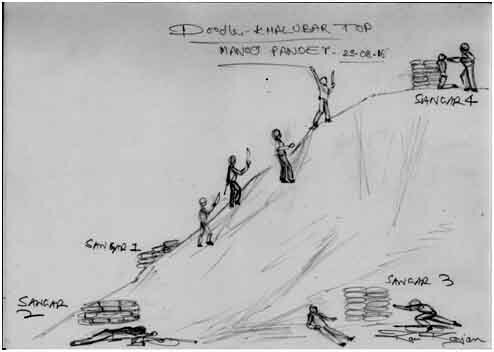 Lalit recalls that it was night 2 July that he chose to head for Khalubar Top with 40 odd men. Directly under observation of the entrenched Northern Light Infantry (NLI) Pakistani troops (Pathans among them), very effective fire was being brought on his column from Khalubar Top and flanks, causing severe casualties. To prevent getting day-lighted before he reached his objective and getting decimated, he ordered Capt Manoj Pandey to take his 5 Platoon, Bravo Company to neutralize “Pehalwan Chowki”, later named as “Bunkers Area”. The CO had by now sustained a bullet wound in his leg and splinter wounds in his calf but slogged on. Capt Manoj Pandey, with experience of the successful, gut-wrenching attack on Jubar Top behind him, rushed to carry out his CO’s directive. 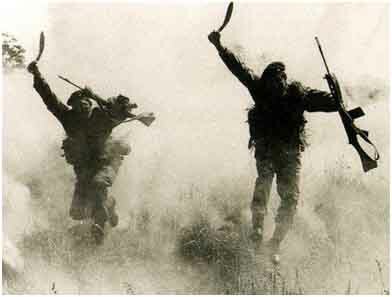 Ordering Havaldar Bhim Bahadur Diwan to encircle the Bunkers Area with his section from the right, Manoj took on the main bunkers from the left with the battle-cry “Jai Mahakali, Aayo Gorkhali” on his lips. He cleared the first two enemy bunkers with dispatch. While clearing the third, he was hit on his shoulders and legs but continued to lead the assault on the fourth bunker, neutralizing it with a grenade. “Naa Chhodnu” he commanded his men, but, at that instant, got hit in the forehead by an MG bullet. 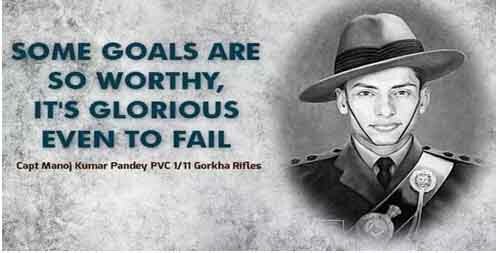 His furious Gorkhas captured all six bunkers, killing 11 Pakistanis but sustaining serious losses in the brutal close-quarter combat. Several Gorkhas were found dead with frozen fingers on rifle triggers, all weapons pointed towards the enemy bunkers with bloodied Khukris nearby and several decapitated Pakistani soldiers heads lying around. The brave young officer had led his men from the front. A compulsive diarist, he had lived up to his own hand-written prophecy that he would “kill death” before death overtook him. He was just 24 and had fully lived up to the timeless ethic of Naam, Namak, Nishan. Doodle of Capt Pandey’s PVC act created after interaction with Col Lalit Rai, VrC. Made by Chief Designer, Ravi Ranjan. The doodle can be seen in Gallery 8 of the Punjab State War Heroes Memorial and Museum, Amritsar, curated by the author and his 10 researchers, then working under Department of Soldier Welfare, Government of Punjab. The narrative does not of course, end here. Colonel Rai, with his right flank secured by Manoj, went up the 80 degree gradient, still under withering enemy fire. He was wounded but soldiered on despite losing men all around him, besides the grievous loss of young Manoj and many of his men. Nearing the top, he knew that his ammunition was about to finish and after that it would just be Gorkha grit and Khukris…nothing more. He personally knew he had two rounds left…One for the enemy who confronted him and one for himself. 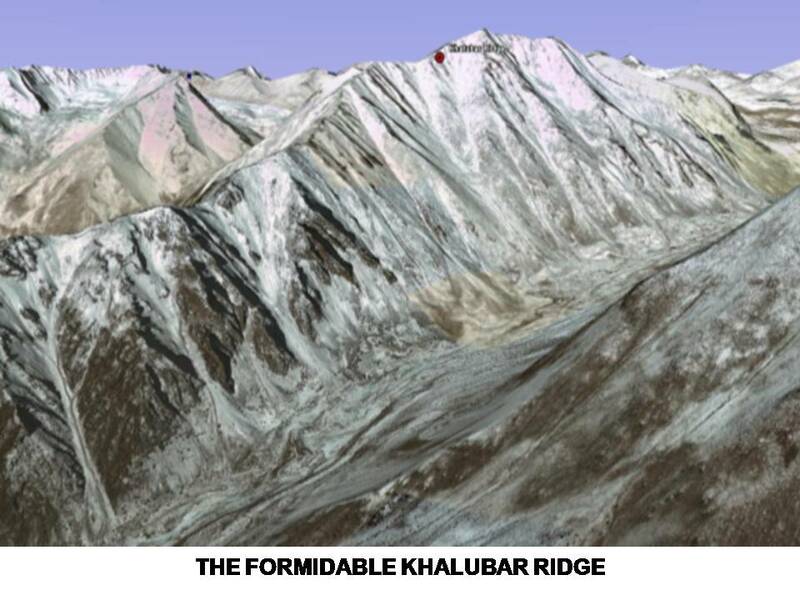 He was able to contact his Forward Observation Officer (FOO) who was on Kukarthang Ridge and asked him if he was indeed headed on Khalubar Top. On confirmation of the same, he asked the FOO to bring own Artillery fire on his position as only a few yards now separated him and the enemy. The stratagem of Defensive Fire Save Our Souls (DFSOS) literally means just that…The last recourse of a courageous soldier to break enemy cohesion. It was a desperate gamble that paid off. The marauding Pakistani Pathans suddenly received a barrage of deathly accurate Bofors 155mm High Explosive shells on them and were decapitated. When the Gorkhas took out their khukris in the brutal hand-to-hand combat that followed, Pakistani heads rolled and there were many…After capturing what was indeed a near impossible objective to capture, the CO did a head count…He had just 8 of his 40 men left and had lost his bravest-of-brave officer, Capt Manoj Pandey along with over half of No. 5 Platoon…1/11 GR had won yet again but at cost…Col Lalit Rai was awarded a Vir Chakra for his outstanding ‘follow me’ leadership and Capt Manoj Pandey a very richly deserved posthumous PVC. 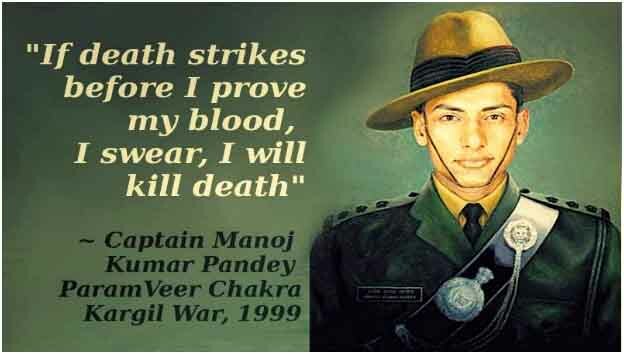 His PVC citation read: “Lieutenant Manoj Kumar Pandey took part in a series of boldly led attacks during Operation Vijay, forcing back the intruders with heavy losses in Batalik including the capture of Jubar Top. On the night of 2/3 July 1999 during the advance to Khalubar as his platoon approached its final objective; it came under heavy and intense enemy fire from the surrounding heights. Lieutenant Pandey was tasked to clear the interfering enemy positions to prevent his battalion from getting day lighted, being in a vulnerable position. He quickly moved his platoon to an advantageous position under intense enemy fire, sent one section to clear the enemy positions from the right and himself proceeded to clear the enemy positions from the left. Fearlessly assaulting the first enemy position, he killed two enemy personnel and destroyed the second position by killing two more. He was injured on the shoulder and legs while clearing the third position. Undaunted and without caring for his grievous injuries, he continued to lead the assault on the fourth position urging his men and destroyed the same with a grenade, even as he got a fatal burst on his forehead. This singular daredevil act of Lieutenant Manoj Kumar Pandey provided the critical firm base for the companies, which finally led to capture of Khalubar. The officer, however, succumbed to his injuries. The award was received by his Father on the Republic’s 52nd anniversary on 26 Jan, 2000. In 2004, Col Lalit Rai had arranged a visit by the parents and siblings of Capt Manoj Kumar to the NDA. It was a dedication ceremony during which a portrait of the brave-heart was presented to Mike Squadron, the squadron where he spent three learning years. Lalit spoke with pride and deep respect for his officer. His father made a brief, poignant address, asking the seated cadets to follow the path of Manoj and, if needed, sacrifice their lives for the Idea of India. The program left the family in tears of pride – and the cadets with an irresistible urge to “do a Manoj” when and if destiny called. Dedication Ceremony at NDA. 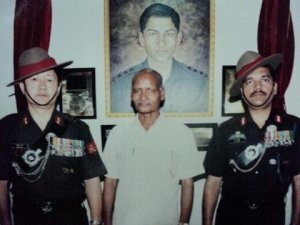 Col Lalit Rai, VrC, is on the right of Mr Gopichand Pandey. The sacrifice of Manoj has impacted on aam aadmi (आम आदमी) [common man] in different but positive ways. One example worth narration concerns a re-employed fellow officer and the father of Manoj. Col AK Jayachandran, 12 ASSAM, who became a senior Bank Executive post his retirement writes that “In life there are some days when one feels terrible and some days, when one feels really good from within. One such thing happened on a Friday evening at around 7 PM last year in Sep. I was set to go home from the Bank. One clerk and an officer were all who remained. The phone rang. An old man was on the other side. He was irate & quite fed up. To cut a long story short, he’d approached his bank’s branch to settle his dues from his son’s pension, which had not been correctly calculated. They’d kept fobbing him off. He could rarely get through and couldn’t explain his problem properly either. Finally he got my number from someone and called. I took his details – told my guys to take a look at it and tell me if he was really due. They did that and yes – there were arrears due to him. Looking at the printout, I saw the name, Capt Manoj Pandey …no wife… …pension to parents …date of death- Kargil war days. Speaking to the old man at 7:30 PM, I asked him if he was the father of PVC Capt Manoj Pandey. He confirmed. I said I would call again. Meanwhile, my staff had closed their systems…both youngsters…ready for a weekend. I sat them down and told them that we had a “PVC”, who hadn’t been paid his dues by the bank. I gave them a short brief on what Kargil was all about; told them that we had to credit the dues tonight. They quietly went and switched on their system. They worked out his dues and arrears, which was around Rs 8 Lakh. This amount was credited into his father’s account at about 9 PM. I called up the father and told him that his account had been credited…he was very surprised, said it could’ve waited till Monday. I apologized for the banks delay and told him that having come to know, waiting till Monday would have been the biggest disrespect/dishonour to the PVC, so we had to do it tonight. I then asked the father to speak to both my subordinates. They paid their respects to him. The old man thanked us and broke down…he said that this one act had accorded more respect to the memory of his son, than any other civilian award. It was an emotional moment. One of these days, you look in the mirror and like the mug that looks back at you…! Capt Manoj Pandey, PVC (P), 1/11 GR deserved that kind of rare respect – in life and in death. 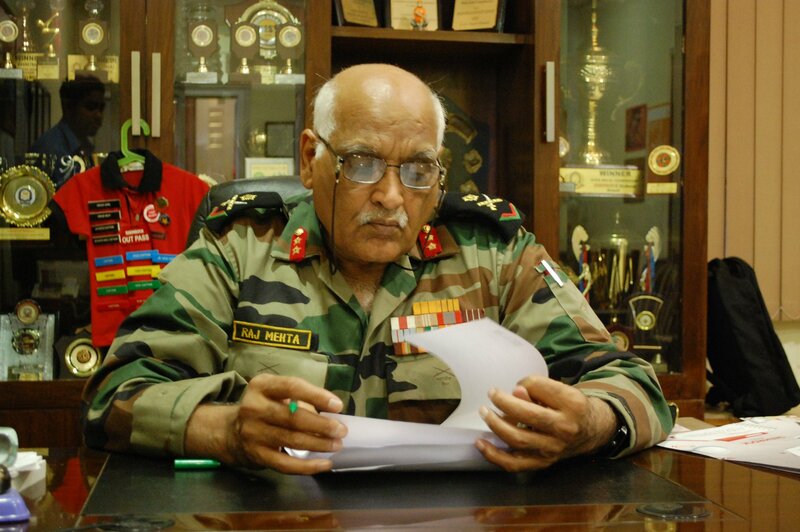 Major General Raj Mehta, AVSM, VSM. The officer is Chief Mentor, Sarthi Museum Consultants, Mohali, Punjab. Gen Mehta was our instructor in DSSC too, after being one in NDA. Served with him later when he was the Deputy 4 Sector RR. He unlike many from the black beret band has high regards for Infantry in general and us Gorkhas in particular. Ask him about 5/8 GR sometime. Manoj and I studied in the same school, Sainik School Lucknow, which has been named after him now. God bless Manoj, a fellow UPSAINIAN and a fellow Gorkha, though from a junior regiment!!!! He was my Coy 2IC in Srinagar and Glacier. It is an moving account. Without waiting for, ‘with your permission please’, I am copy pasting on my course 25 Silver Jubilee Course, yahoo Groups.